Wikipedia aims to collect “the sum of all knowledge.” But what counts as knowledge, and how we get it, is a complicated, and often untold, story. That’s why history of science courses can make a real difference on Wikipedia. The history of science calls on students to explore the roots of scientific concepts. They draw from different fields to examine science as an intellectual and cultural pursuit, connecting historical research methods with methods from fields as varied as anthropology, philosophy, sociology, and law. Writing a Wikipedia article instead of a traditional history of science term paper brings this approach to life. Dr. Peter Ramburg at Truman State University assigns students to write about figures in Western science. This spring, those Wikipedia articles were read 1.29 million times. That included a biography of Caroline Herschel, a German astronomer and first Western woman to be paid for science. At the University of Oklahoma, Dr. Peter Barker assigned students to write about science during the Cold War. Those students added more than 85,000 words to Wikipedia articles. Here are five reasons why history of science courses are a great fit for Wikipedia. 1. Readers turn to Wikipedia for information about the historical and social tradition of the sciences. 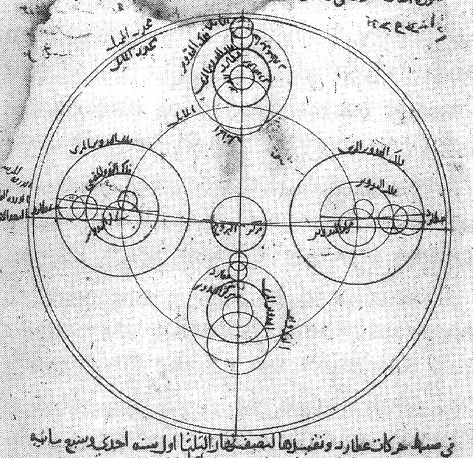 Ibn al-Shatir’s model for the appearances of Mercury. Public Domain. Wikipedia makes an ideal starting point for inquiries and critiques of how science, like all knowledge, is socially constructed. The authors of Wikipedia reflect a very specific perspective: Most contributors are white, Western, and male. Articles are often incomplete in ways that reflect this audience: Compare the article about Ibn al-Shatir, the Arab astronomer who discovered the laws of planetary motion 150 years before Copernicus, to the article for Copernicus, and you begin to get a sense of how Wikipedia can skew. By working with Wikipedia, students can examine the influence of that perspective, while contributing new information to the encyclopedia. 2. Wikipedia articles are never finished. When is Wikipedia “complete”? That may be an easy question: never! But when is a science article “finished”? Contributors decide what to include, and what to leave out. Students working on Wikipedia can learn firsthand how communities conduct that debate. It’s a field trip to the public sphere. As students engage with other Wikipedia contributors, they see the process of how knowledge is organized, contextualized, and agreed to. It’s rare that undergraduates have the opportunity to engage in this kind of experience without publishing their work in an academic paper. 3. An essay doesn’t help the public’s understanding of science. When a student writes an essay, it’s read by an instructor, graded, and tossed aside. By the time these students are in your course, this is a rote exercise, a factory assembly line that transforming their innate curiosity into slivers of dead trees. When that same energy is expended to Wikipedia, students know that they’re really contributing to a greater cause. They’re helping other people learn about what they’ve learned. Meanwhile, Wikipedia’s readership has better access to information that helps them understand, and contextualize, science history. 4. Students compare their knowledge to Wikipedia’s. A Wikipedia article brings their curiosity to life. It encourages students to read and reflect on gaps in science history and context. But it also dares them to make a difference. We find that students who write for Wikipedia are more deeply engaged with their writing. They think deeply, critique Wikipedia’s presentation of existing knowledge, and then internalize that critique for their own writing. We’ve heard time and time again that this is an empowering moment for students. It transforms the “I know this” thinking required for presenting their knowledge to an instructor. That becomes the “I know this” that students require to apply their knowledge into new contexts with confidence. 5. There’s a lot of work to do. Wikipedia presents a somewhat limited vision of science. It’s built on the backs of academic research and the consensus that forms that record of scientific history. Left out are various positions of analyzing that history. As we’ve already noted, the history of science on Wikipedia is very often a history of white, male, Western science. That leaves the door open for students to find gaps and identify bias. Students can contribute biographies of women scientists, which are vastly underrepresented on Wikipedia. They can provide a history of science and technology in various regions, time periods, or non-Western methods. In fact, almost any academic topic on Wikipedia can be expanded or improved. Wikipedia is most complete in the areas that have enormous interest among Wikipedians. Consider this: A list of the articles determined to be the highest quality on Wikipedia includes 815 articles about military history, but just 47 about the history of science. There’s plenty of room to make a difference! The Wiki Education Foundation is an independent non-profit organization that has been working with instructors to design Wikipedia assignments since 2013. We can help create a plan that works alongside an existing syllabus, or to create a new one. Crucially, Wikipedia assignments never have to be the focus of the course, or take time away from your instruction. We offer online trainings and printed editing guides, free of charge, for your students to use at home. Our staff is on hand to answer questions about Wikipedia, and let you focus on what you want to teach. We also give you tools to track student contributions, and see the impacts that your course is making on Wikipedia. If you’d like to start a conversation about what Wikipedia can do for your classroom, let us know!Send an email to contact@wikiedu.org. You can also check out our resources, or our special Year of Science page. And if you still need to be convinced, see what past and current instructors have to say. A wonderfully succinct piece on the benefits of incorporating Wikipedia into higher education.